We strive to keep our shipping rates as low as possible. 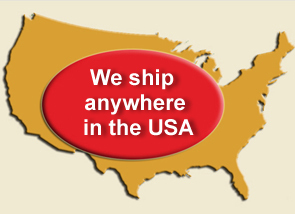 If you live outside of the United States (Alaska or Hawaii) please call us for a shipping quote. There may be some exceptions to this chart due to remote shipping. 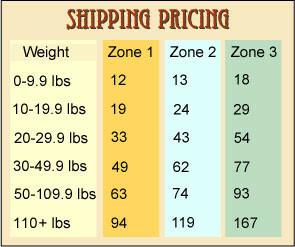 For items that weigh over 50 lbs we must ship by pallet. All rates shown in chart are for businesses with a dock or pick up from the nearest truck terminal. We also can ship directly to your home but additional shipping charges may apply. Also cost to ship to Costal areas and/or remote areas may, on a rare occasion, incur an additional charge. In the rare case that this is necessary we will contact you by phone or email. If you are unable to off-load your items, there is a $75 charge for a lift gate to lower your furniture from the truck. It is easy for most people to off-load by hand, however if you think you need a lift gate call us to request one. For your convenience, we have made a chart for you to follow. Below you will see each State and what zone they fall under. Based on this chart, you will be able to see what your shipping costs will come too. If you do not see your state or if you have a question or concern, please email us at: info@twigfactory.com or call us Toll-Free: 1-800-918-6184.